It seems like it's birthday party season for us and we sure do love celebrating some of our favorite little friends! 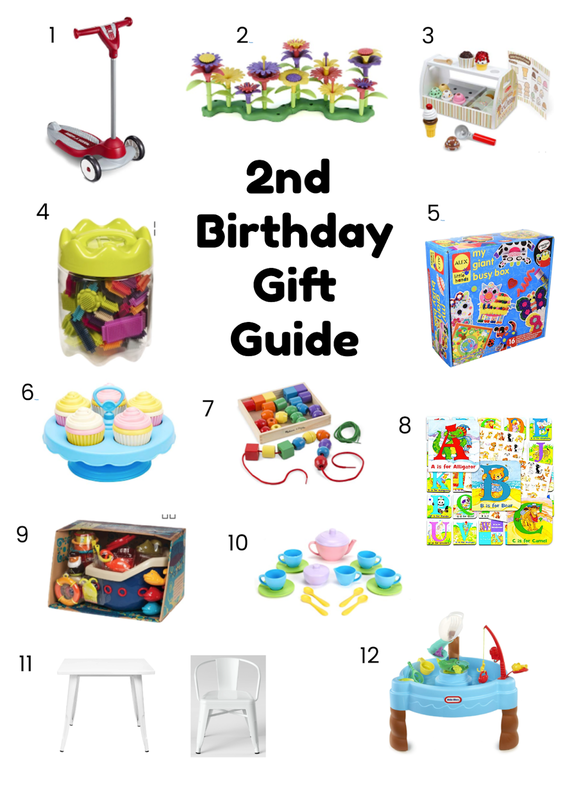 After putting together a 1st Birthday Party gift guide, I thought it would be fun to share a gift guide for ages 2, 3, 4 and 5 too! So, here are a few of my little ladies favorite gifts they received when they were TWO, I hope this helps if you find yourself in birthday party season too. 1: Radio Flyer "My First" Scooter- My little ladies LOVE scooting around our neighborhood and I love giving a gift that encourages kiddos to get outside and play! 2: Green Toys Build a Bouquet- Avery got this when she was 2 and it is still a favorite in our house, you can sort the flower pieces by color or shape and build them as tall or as small as you would like before arranging them on the grass, love a toy that encourages creativity. 3: Melissa & Doug Wooden Scoop and Serve Ice Cream Counter- This is another favorite at our house and if I'm honest, it's one of Mama's favorite toys to play with! This set is worth every penny, it comes with a menu and after having this set for three years, it has held up SO well. 4: B. Toys Brissle Block Stackadoos- My girls love building with legos, but these are a really fun alternative! I also love that it comes in the container, which makes it easier to store. 5: ALEX Discover My Giant Busy Box- Our neighbor gifted this Busy Box to Avery on her 2nd birthday and it's my go-to gift! It comes with a ton of projects you can complete with your little artist, or you can lay out some of the supplies and just let the kiddos create. 6: Green Toys Cupcake Set- We LOVE Green Toys, toy brand and this cupcake set is another great toy to practice sorting colors! My girls love to set-up a cupcake shop and the quality of this set is also amazing! 7: Melissa & Doug Primary Lacing Beads- Are you starting to see a theme here? I love "tricking" my girls into practice shapes, colors, numbers, letters, etc. these lacing beads are perfect because you can un-do the necklace and make it again and again! 8: Animal ABC Board Book Set- Emmy has a similar ABC box set and has learned every single letter by choosing three books to read at night, every night and then selecting another trio of three once she has the previous letters down! Before we read each book, we say "Letter ____, Sound ___," so our little lady knows all of her letters and sounds, can you tell I use to be a reading specialist!? 9: B. Toys Fish & Splish- I can't stand buying a toy just to add to clutter, my girls love bath time and this toy was such a fun one to add to our tub! Again, I love that you can store everything inside the cute ship too. 10: Green Toys Tea Set- Every kiddo needs a tea set in their play food collection, another Green Toy favorite, my girls love setting-up tea parties for us and their favorite stuffed animals. 11: Pillow Fort Activity Table & Activity Chairs- This gift would be great for grandparents to give their favorite kiddos, it's such an awesome investment and worth every penny! We own this table, it's super sturdy and speaking from experience, an adult can sit in the chairs very comfortably. 12: Little Tikes Fish 'n Splash Water Table- We LOVE spending time outside and even Avery still loves to play with our water table! We like to bring our LOL Dolls, princess, farm animals, etc. outside to wash and clean, add a little dish soap to the mix to make it a bubble bath and watch your kiddos have SO much fun! Do you see any of your favorite toys in our list!? We own every single one of the toys I listed and play with them all on a weekly basis, minus the water table, but we are SO ready to bust that out again once this Chicago weather warms up. Do you have a go-to gift to give to your favorite two year olds!? Share some more gift ideas in my comments, I can't wait to add some toys to our gift list! If you want to see more of our daily adventures, come follow our family on Instagram!